From the early 1970s, the immigrant Turks, though considered as temporary workers, started to become investors. The first investments were made mainly in small grocery stores, butcher shops, and travel agencies. It is estimated that around 150 thousand Turkish citizens live in England. This number includes the refugees and the undocumented Turks who immigrated to England in great numbers after the 1970s. Is Turkish Electronics Ready to U.S. Market? As the sector is not only that of a unique industry having a market share of 1 trillion USD, and holding the rank of being the highest employer sector for the 21st century, but also has become the basic sector improving all the other sectors. The Electrical-Electronics and Machinery Industry is considered to be one of the major sectors of Turkey, as it is the source of information technology used by the developed nations to ensure competitive advantage. 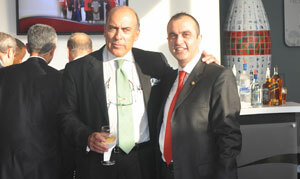 Muhtar Kent with Cemil Ozyurt, TURKOFAMERICA's editor-in-chief in Atlanta. The Turkish state minister for foreign trade defined the aim of his visit to the United States as an opportunity to discuss investments in Turkey. 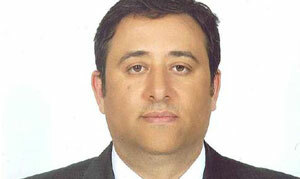 "The aim of this visit was also to raise U.S. awareness about Turkey," Turkey's State Minister Zafer Caglayan told. Caglayan said he visited four states and held important meetings, particularly with the executives of leading U.S. companies. HOW WILL THE GLOBAL CRISIS AFFECT THE EXPORT TARGET? Despite the fact that Turkish exports have been rising uninterruptedly since the 1980s, the recent global crisis means that Turkish exporters must now direct their activities towards new outlets. While Turkey exports 55 percent of its total exports-- quite a conspicuous share--to the countries of the European Union, the USA has remained below its potential as a trade partner. Why Haven't We Been Affected by the Crisis? In May 2006, Sefa Stone began serving American consumers with its 16,000 sq.ft. depot in Miami. The reason the company chose the city of Miami, the heart of the East Coast, is the high demand for natural stone in that area. How Will Businessmen Survive During the Global Crisis? On February 7, 2007, the Reuters News Agency sent its subscribers a seven sentence news item. The news item said that the subprime and risky loans of British-based HSBC Holdings had reached 10.5 billion dollars in 2006, and that this was more than 20 percent over what the analysts had been expecting. The jewelry sector, which is one of the sectors most ambitious to make its landing as Turkey’s global brand, realized exports of $2.6 billion in 2007. Representatives of the sector have declared their goal of becoming the global leader by reaching exports of $10 billion in 10 years.